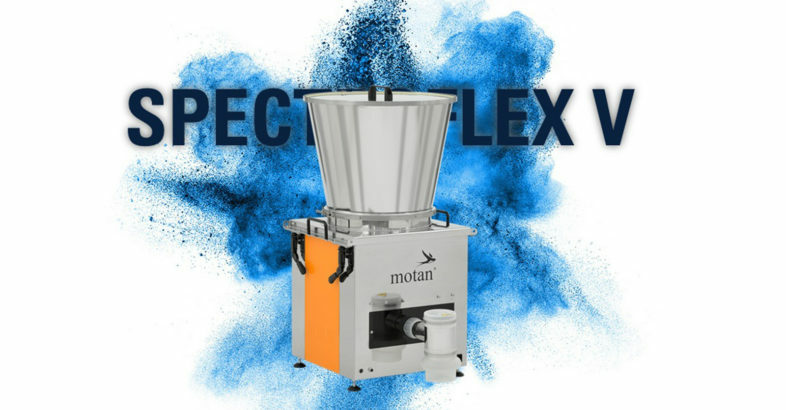 Whether powder, pellets, regrind, granulate, flakes or fibers – the new SPECTROFLEX V by motan-colortronic is the volumetric dosing unit for continuous processes, designed for many different applications. Should material colour, flow properties or grain size change, than motan´s unique exchange system offers a simple way to swap materials without the need of tools in under a minute. 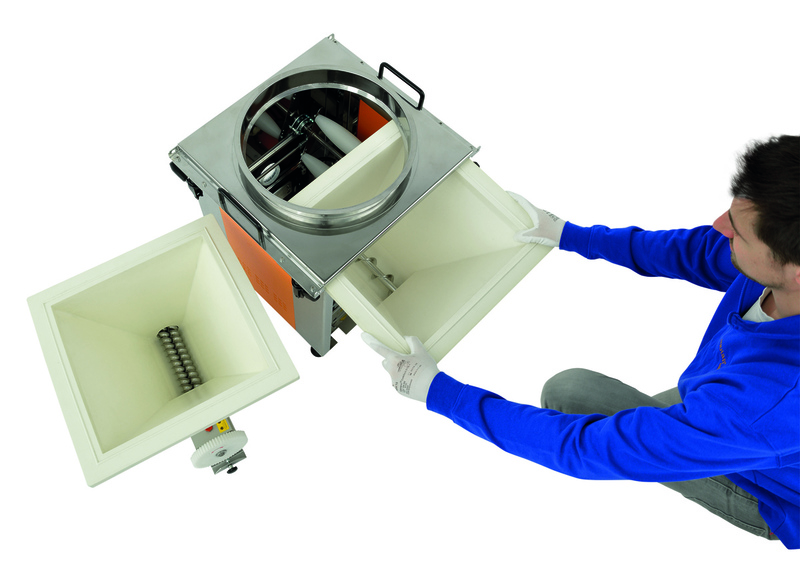 The single- and double-screw exchange modules as well as the easy-to-clean supply hopper allow for fast and easy material changes and so reduces production downtime. A further advantage: the material loader mounted on the cover of the supply hopper does not have to be removed during the material change. Resulting in higher efficiency and shorter downtimes in your production. Thanks to the function of the massage-rollers, even non-free flowing and fragile materials are no longer a problem. Powered by an independent motor and designed for 48 different settings, SPECTROFLEX V offers high dosing accuracy for a wide range of materials – even for small dosing quantities. The special design of the oscillating elliptical rollers also extends the service life of the polyurethane dosing hoppers. The SPECTROFLEX V is equipped with an intuitive touch screen for trouble-free and simple control. 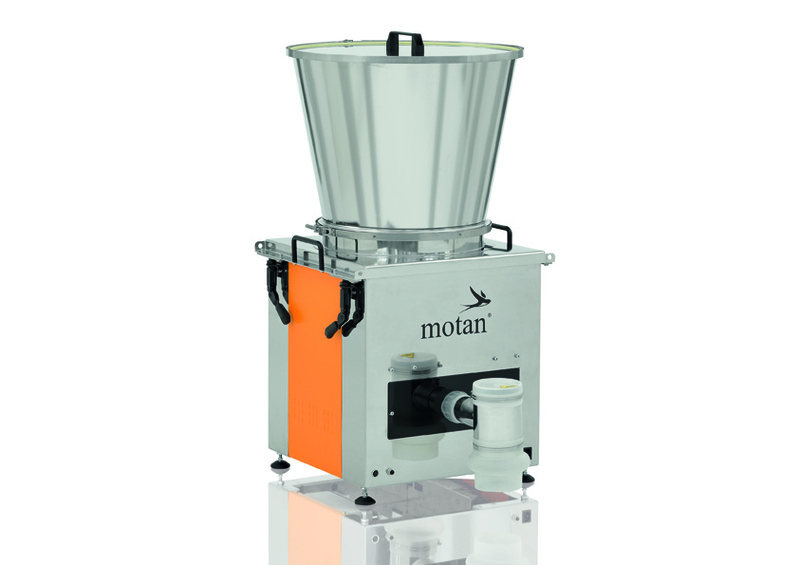 The integration into an existing motan CONTROLnet network is possible via an Ethernet interface – as an option the conveying control can also be integrated. The new SPECTROFLEX V dosing unit is the cost-efficient option for continuous processes with a network-compatible control and can be ordered as of now. The motan group based in Constance on Lake Constance was founded in 1947. As leading provider for sustainable raw material handling, they operate in the areas injection moulding, blow moulding, extrusion and acompounding. Innovative, modular system solutions for storage, drying and crystallisation, conveying, dosing, and mixing of raw materials for the plastics manufacturing and processing industries are part of the application orientated product range. Production takes place at different production sites in Germany, India, and China. motan-colortronic distribute their products and system solutions via their regional centres. With over 500 employees currently, a yearly turnover of roughly 118 million euros is achieved. Because of their network and long-standing experience, motan can offer their customers what they really need: Individually tailored solutions with real added value.